The Supreme Court has remanded to the Division Bench of Allahabad High Court, the matter pertaining to the validity of certain questions in the Uttar Pradesh Teacher Eligibility Test (UPTET), 2017. 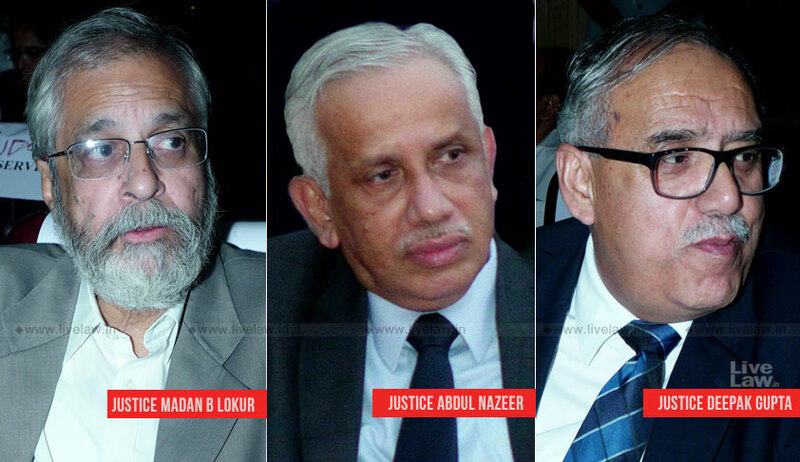 The Bench comprising Justice MB Lokur, Justice S. Abdul Nazeer and Justice Deepak Gupta clarified that any appointments made will be subject to the outcome of the decision rendered by the Division bench of the High Court. The State of UP announced over 68,000 vacancies for the post of primary school teachers in the State. These vacancies were to be filled through the Assistant Teachers’ Recruitment Exam, 2018—a competitive exam for which clearing UPTET is an eligibility criteria. UPTET, 2017 was therefore held in October last year, with 60% as the prescribed passing marks. However, several candidates petitioned the Allahabad High Court, alleging mistakes in the answer key. The Single Judge then allowed the 316 petitions filed by the candidates, quashing the result of the exam to the extent of fourteen questions and directing fresh evaluation of all answer sheets post deletion of the fourteen questions from the total number of questions. The authorities were directed to declare the results accordingly. The State, however, approached the Division Bench of the High Court, challenging only one out of the 316 writ petitions allowed by the Single Judge. The other petitioners were neither added as respondents, nor served with a notice or heard by the court. The Division Bench had, among other things, found only three questions to be incorrect, on the basis of a “confidential report” submitted by a panel of subject experts appointed by it. The report was allegedly never shared with the contesting respondents in the said appeal. The High Court had further upheld the correctness of ten other questions and had ruled that the four questions deleted as being ‘out of syllabus’ by the Single Judge were actually within syllabus. The Single Judge’s order was modified to this extent. Challenging this judgment, the petitioners who had not been heard by the Division Bench now claimed that these four questions were not referred to the panel of experts, and instead, “the Division Bench assumed the mantle of a Subject Matter Expert on these questions”. The court, therefore, set aside the impugned judgment passed by the High Court and remanded the matter to the Division Bench for reconsideration on merits. “Any appointment(s) made will be subject to the outcome of the decision rendered by the Division Bench of the High Court,” it added.